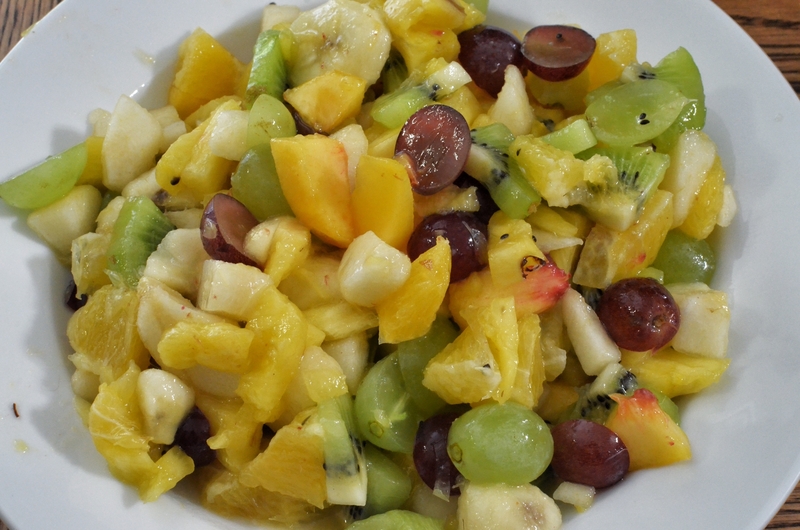 I’ve been on a fruit salad kick. Lots of fresh fruit at the market this time of year. Grapes are a mainstay, I use both red and green grapes and I like to cut them in half unless they are really tiny. Seedless grapes are easier but I have spent a lot of time scraping seeds away when those aren’t available. Also in this one are pears, peaches, kiwis, pineapple, oranges, and bananas. Kitteh! 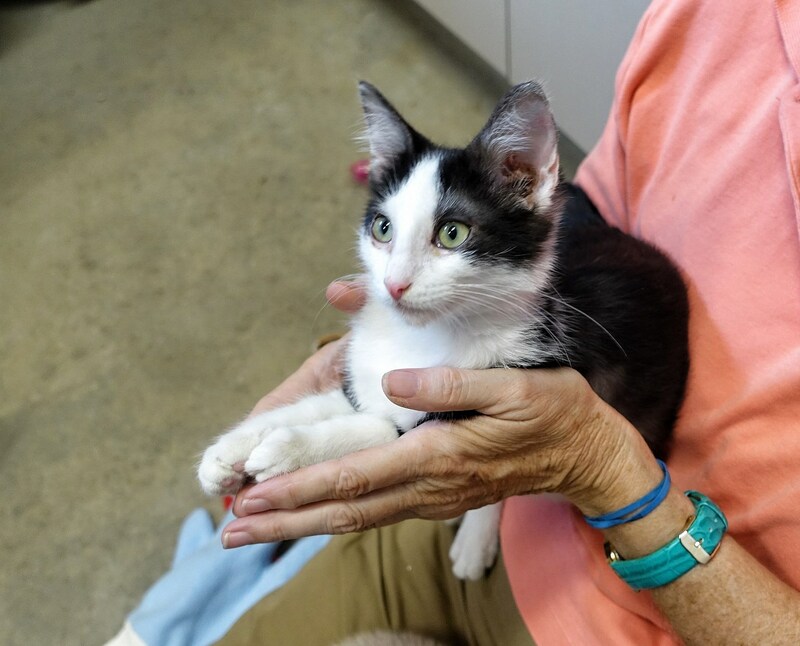 Here’s a 3 month old male. Mrs J says they named him Diti but she will not swear to the spelling. D. T.? DeeTee? Ditty? Mmm… cheeseburger. 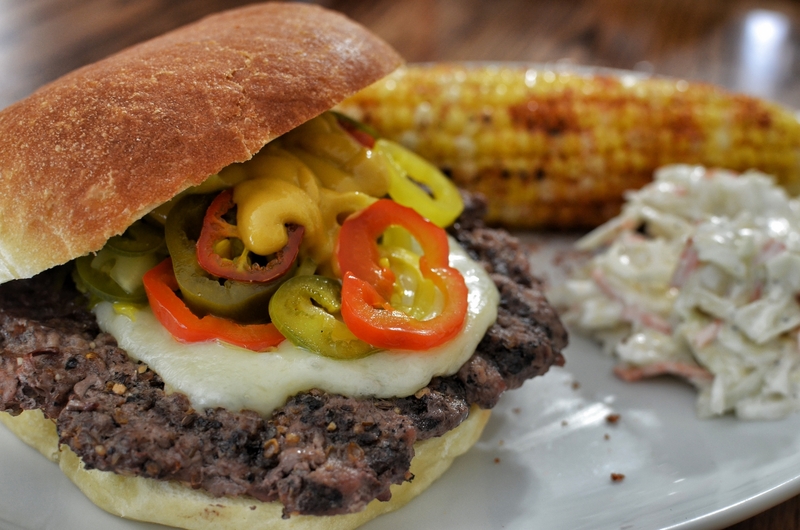 This one has Swiss cheese and a pile of pickled peppers. More of those roasted rosemary Parmesan potatoes. 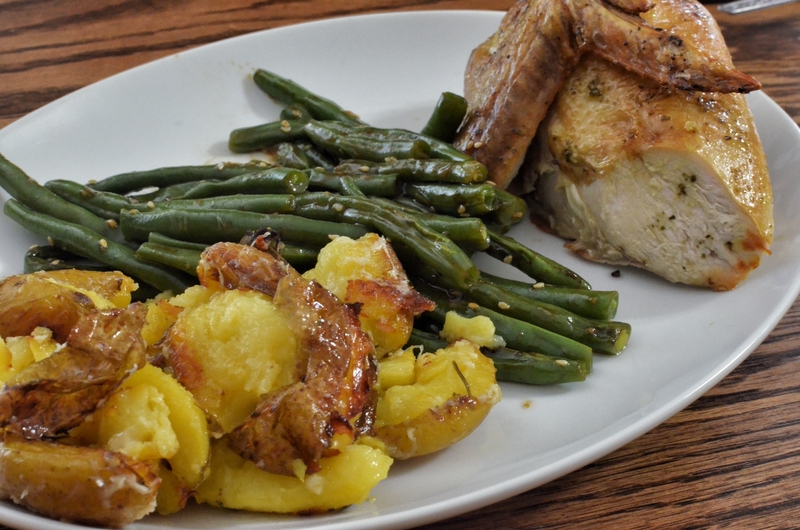 These are Yukon Golds and they are plated with sesame green beans and a piece of roasted chicken. Moar Kitteh! 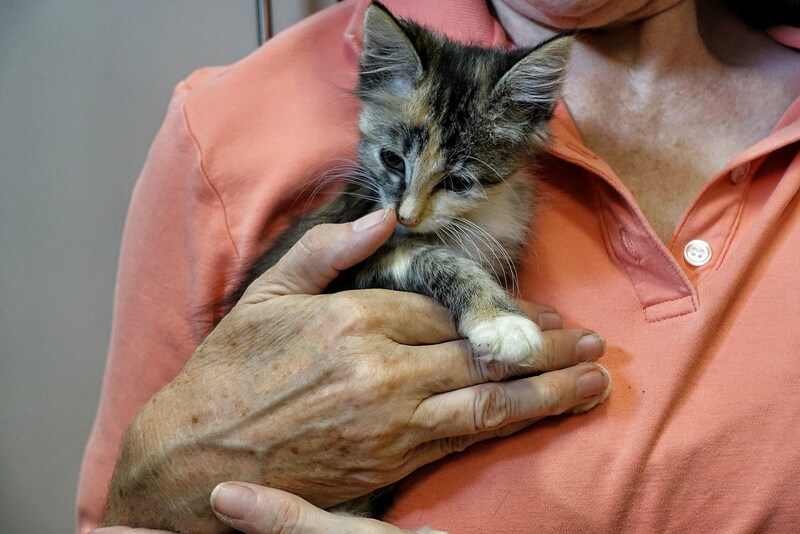 This is Kaitlyn, an 8 week old female with interesting coloration, a tabby/calico look. That’s Kaitlyn there – right up against the blue watchband on this kitten house staffer. 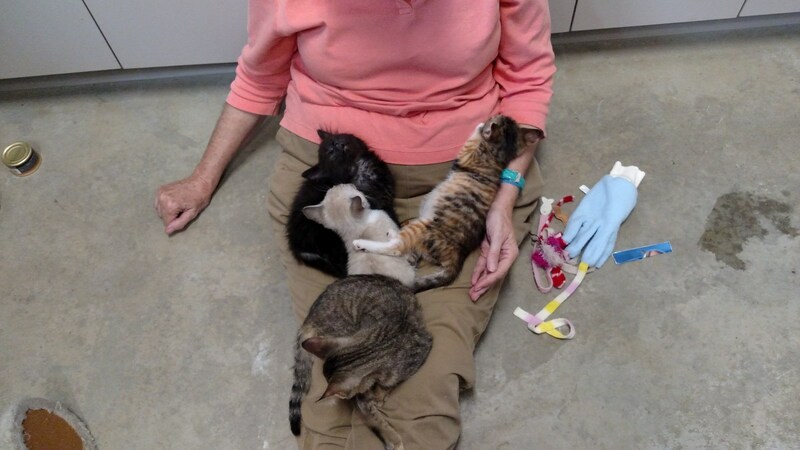 They call that staffer “the cat whisperer” because she can really get a feral cat calmed down and purring. 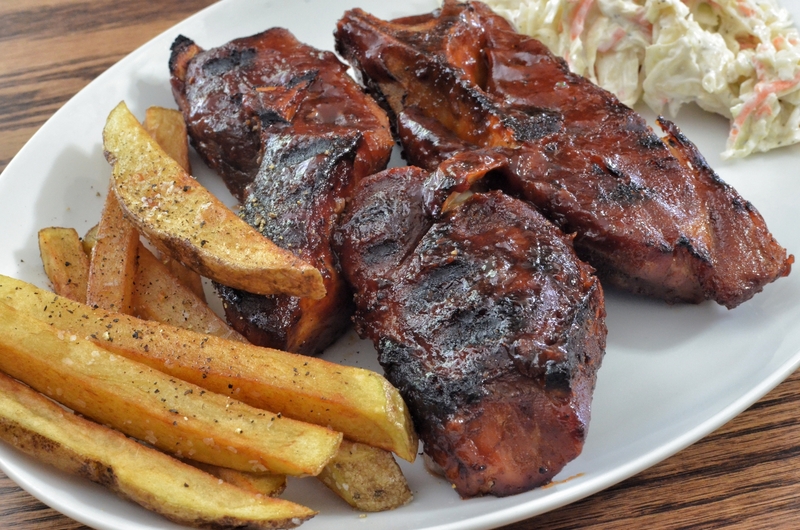 Country ribs and fries. I have my best luck with these pork “logs” when I braise them, covered, in a low oven, say 225 to 250. I use broth as the braising liquid, adding bbq sauce at the end and uncovering them to help reduce the sauce. 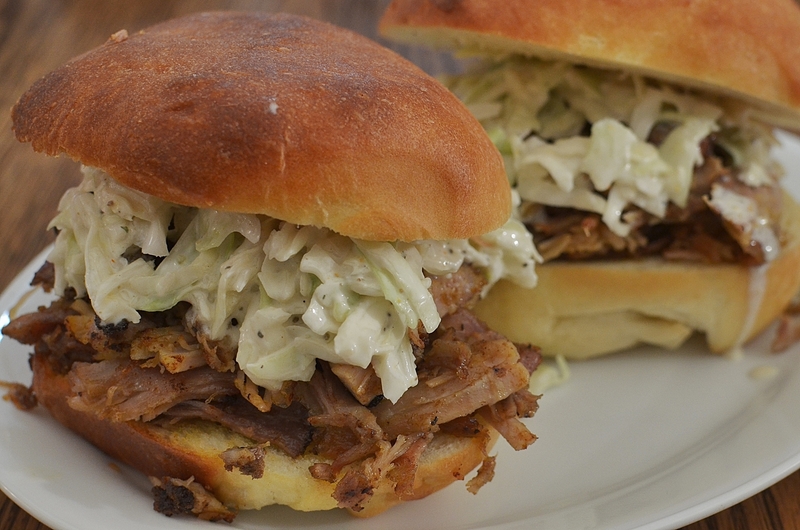 These were finished on the outside grill but they can be done under a broiler – watch them close so they don’t char. 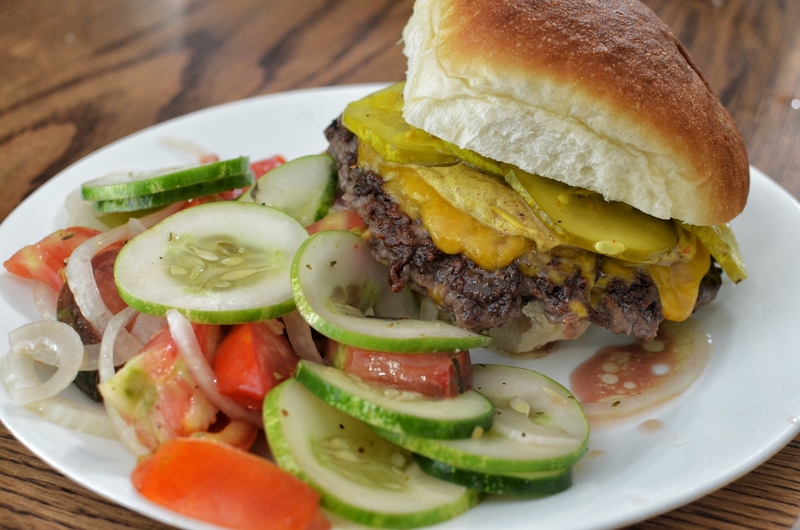 Here’s another cheeseburger, this one is garnished with some of those refrigerator pickles. On the side is one of my favorite summer salads of tomatoes and cucumbers with onions in a vinaigrette. It’s better the next day but isn’t bad when freshly made like this one. 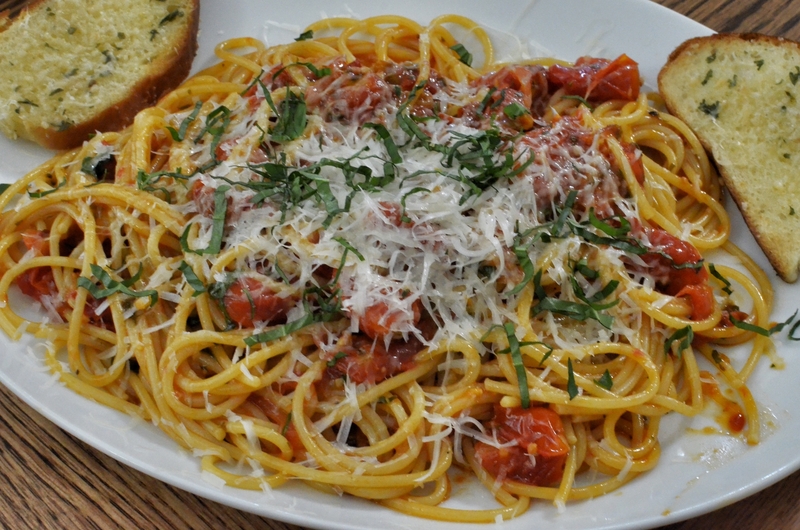 I look forward to making this dish every year when the little tomatoes come in strong. We have grape tomatoes this year instead of the cherry variety but they are much the same thing. I saw this recipe where the tomatoes were roasted in the oven before they were mixed with the usual herbs and garlic and went with that method today. I think it worked very well. The thing about roast pork is that you can reheat it in a skillet and it will produce more of those crispy bits that add so much flavor. Lard works great, duck fat is probably the best. If those scare you olive oil works just fine. 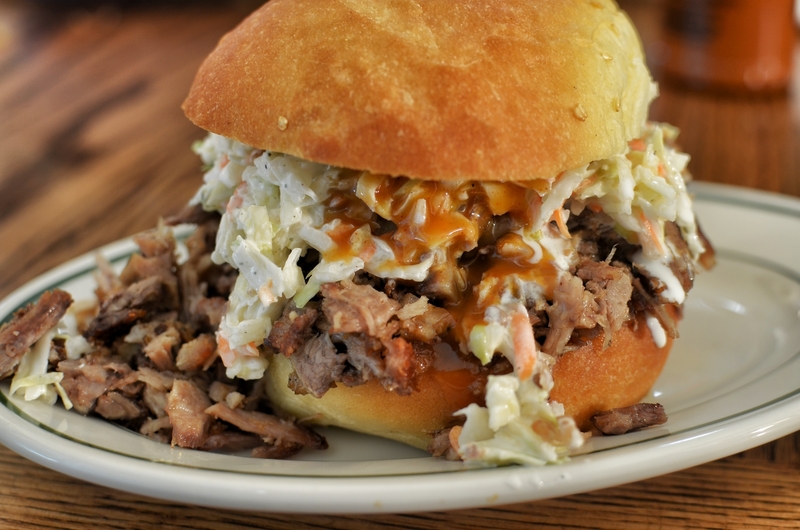 This one has a mayo based slaw but a vinegar slaw will be just as good. The local Kroger had pork butts way cheap so I bought a couple, one for freezing and one for immediate use. It got a dry rub and sat for a while and then was dropped into a covered pot with some broth to braise in a 350 oven. I think it was in there for about four hours. Long enough the bone pulled right out. I bought a bag of shredded cabbage to make a slaw so I wouldn’t need to break out the counter top machine. The dressing is mayo with a little rice vinegar, salt and pepper, a daub of Dijon, a squeeze of lemon juice, and a sprinkle of red pepper. These didn’t get any BBQ sauce because they taste good without it but the one I made for Mrs J got a good toss in the skillet with Sweet Baby Ray’s finest. Writing about Julia Child’s birthday the other day gave me a good laugh when I found her dancing chicken video. I’ve been wanting to roast a chicken for a while, but when it’s so hot, turning on the oven is the last thing I want to do. It was supposed to be cooler this weekend, so I picked up a 5 lb roasting chicken. Today I put it all together. 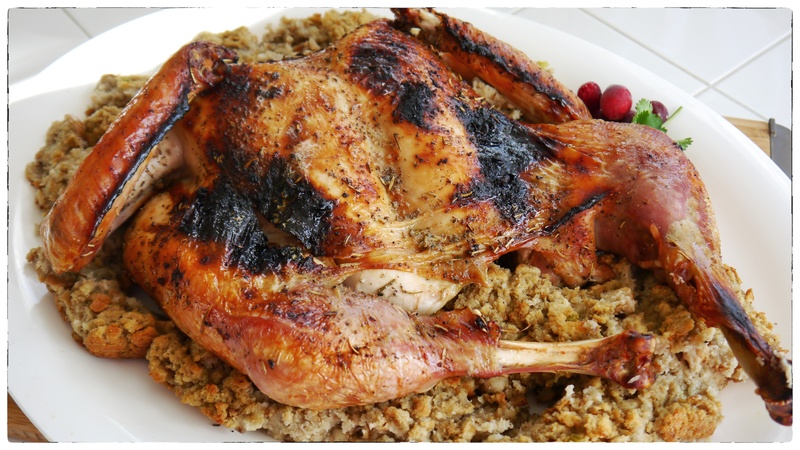 Roasting a chicken is a pretty quick and easy meal. Cooking time is about an hour and a half (17 minutes per pound is the general rule, at 375 degrees F). First, wash and dry the bird. Gently use your fingers to pull the skin away from the breasts and down to the thighs. Careful not to tear it. I made a paste of finely minced garlic, rosemary, sage, and olive oil. Spread the paste under the skin. Next fill either a spice infuser, cheesecloth or I use an unbleached coffee filter, with a lot of garlic, rosemary and sage, and maybe a bit of thyme, and put it in the cavity. I also added 1/2 of an onion, quartered. 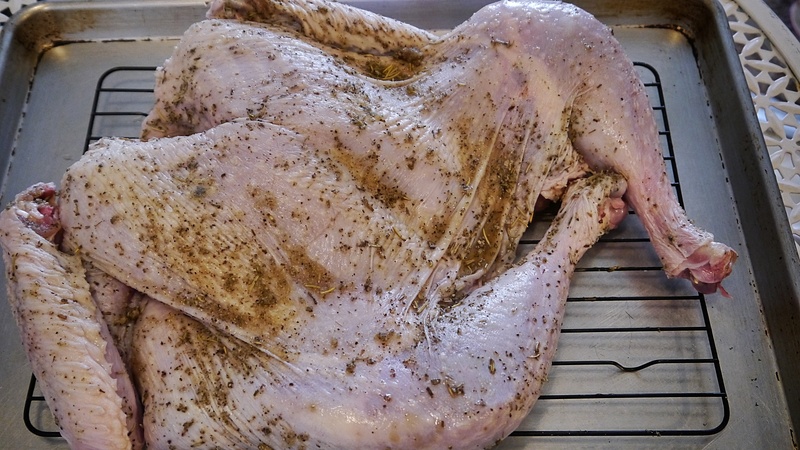 Tie off the legs, place in the roaster and brush the bird with a mix of olive oil and bit of butter. Don’t forget to tuck in the wing tips so they don’t burn. I let it sit for 15-20 minutes to allow it to come to room temperature and allowing everything to meld together. I roasted it at 15 minutes at 450 degrees, lowered the heat to 375 degrees and roasted it until thermometer read 160 degrees. I brushed it a couple of times with the oil/butter mix. Took it out and let it rest for 15 minutes before carving, at which point the internal temp was 165 degrees without drying it out. Remove and discard the spice infuser and onions. Slice and serve. This is from America’s Test Kitchen and it is on my list to try this weekend while I have some extra time to play in the kitchen. I thought they sounded delicious and a nice way to dress up a side when company comes to dinner. *This recipe is designed to work with potatoes 1½ to 2 inches in diameter; do not use potatoes any larger. It is important to thoroughly cook the potatoes so that they will smash easily. Remove the potatoes from the baking sheet as soon as they are done browning—they will toughen if left too long. A potato masher can also be used to “smash” the potatoes. 1. Adjust oven racks to top and bottom positions and heat oven to 500 degrees. Arrange potatoes on rimmed baking sheet, pour ¾ cup water into baking sheet, and wrap tightly with aluminum foil. Cook on bottom rack until paring knife or skewer slips in and out of potatoes easily (poke through foil to test), 25 to 30 minutes. Remove foil and cool 10 minutes. If any water remains on baking sheet, blot dry with paper towel. 2. Drizzle 3 tablespoons oil over potatoes and roll to coat. Space potatoes evenly on baking sheet and place second baking sheet on top; press down firmly on baking sheet, flattening potatoes until 1/3 to 1/2 inch thick. Sprinkle with thyme leaves and season generously with salt and pepper; drizzle evenly with remaining 3 tablespoons oil. Roast potatoes on top rack 15 minutes. Transfer potatoes to bottom rack and continue to roast until well browned, 20 to 30 minutes longer. Serve immediately.